Bill Volkening, Larry Kidd and Don Randall stand at attention while waiting for their que to fire a 21-gun salute at a funeral service for Clinton Kinney on Monday afternoon at Reyonlds-Jonkhoff Funeral Home. Kinney, a veteran of the World War II, fought from 1943 to 1946 in England and France with the Third Army. 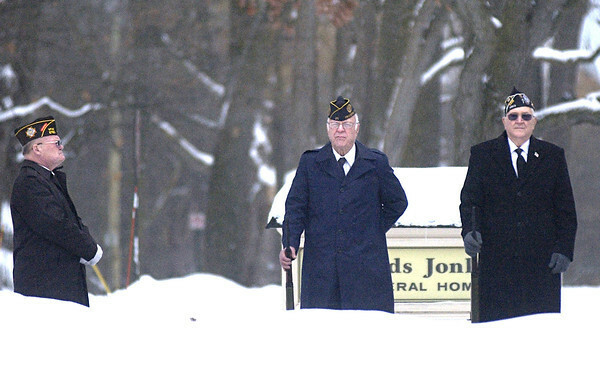 The honor guard consisting of members of VFW Post 2780 and American Legion Post 35 stood outside the funeral home waiting to perform their duty while temperatures hovered near 10 degrees.